Have you heard that they’re going to allow proper nouns in Scrabble? Is nothing sacred anymore? Between this and the “reimagined” abomination that was the CLUE app, I really needed some classic board gaming action to get me back to my happy place. The Trivial Pursuit app washed out some of the bad taste from my mouth, but it’s clear that all the old-school board games of my youth are headed in a new direction. I’m sure I sound like a cantankerous geezer at the ripe old age of 25, but it’s disconcerting when all of the games I remember as a kid don’t look the same anymore. Thankfully, the Trivial Pursuit app hasn’t changed things too much, but it’s clear they’re trying to draw in a younger audience. The game plays exactly like the classic board game, only you now have the option of choosing easy, medium or hard questions, and the questions are much easier, even on hard. As a kid, I remember games lasting hours because no one knew any of the answers, but there were only a scant few I couldn’t answer for the app. Obviously classic games go much faster this way, but there’s also an ultra-streamlined version called “Pursuit” with a much simpler board and a small handful of questions. You also have the option of single-player, multiplayer over Wi-Fi, and also multiplayer “pass ‘n play”. I had trouble getting the Wi-Fi option to work, with was very annoying, but the pass ‘n play worked fine, and the single player was surprisingly fun. I thought it might get a bit dull, but the AI worked out better than I expected, and even playing by myself wasn’t too bad. You can set up a player profile and customize games to suit your playing style. Their selection of “mascots” to represent you during a game was also a little thin, but the art was cute. Should you get bored with the questions, there are additional question packs available for purchase. I didn’t encounter any doubles during my games, but a quick glance at the iTunes reviews tells me that a few people have had problems with them. I didn’t really have any complaints about the interface, other than the somewhat silly shaking mechanism for rolling the dice, but I think a save option would have been nice, since classic games can still run a bit long. In general, the look and feel of the game is more than adequate, plus, it’s a lot cheaper on the iPhone than the physical board game. The old and cranky part of me says that I will never love Trivial Pursuit on the iPhone, but the rest of me says that it’s a perfectly reasonable way to win over new trivia fans in this age of technology. 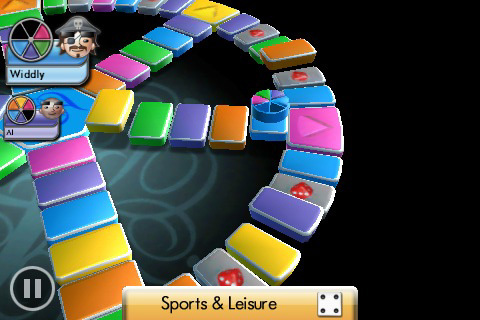 AppSafari review of Trivial Pursuit was written by Tracy Yonemoto on April 10th, 2010 and categorized under App Store, Fun, Games, Multiplayer. Page viewed 6536 times, 1 so far today. Need help on using these apps? Please read the Help Page. Subject: Trivial Pursuit App. I see from the positive posts that this App/Game can be adjusted so that the questions difficulty can be adjusted. If so; I am missing something. I have adjusted the SFX level and it appeared not to change anything. I tried downloading new questions and still had no success. If you could direct me to a solution of my problems it would be greatly appreciated.